Centauri Dreams discusses the NASA NIAC Breakthrough Propulsion Architecture for Interstellar Precursor Missions project. The system could propel a 12-year mission to 500 AU and could send missions to Pluto/Charon in 3.6 years and Jupiter missions in roughly a year. The laser power is beamed to provide energy for the superior next generation ion drive. This means the ion drive can be pointed in different directions to move in any direction and to slow down. This means the systems could maintain their position with large telescopes at the gravitational lens points and shift to move around the sun to observe different stars and exoplanets on the other side. New Horizon will take 13 years to reach 43 AU and will take 160 years to reach 500 AU. Beaming megawatts of power enables vastly larger and more capable missions. Currently by bringing bulky nuclear power the missions have to be smaller and are power limited and size limited. Having megawatts beamed to the mission with lasers enables 80-ton missions to Jupiter versus less than two tons for the Galileo mission. The Galileo mission had less than a kilowatt of power. The system needs a 2-km diameter aperture with an output power of 400 MW at a laser frequency of 300 nm driving a vehicle with a 110-meter diameter photovoltaic array powering a 10 MW electric propulsion system at a specific impulse of 40,000 s.
Phase II work will develop a technology roadmap including technology demonstration missions recommended as stepping stones to get to the final system architecture. Both the laser array and the PV arrays are easily extended to larger power levels. The mass per unit power of the laser amplifiers is about 5 kg/kW currently with a strong push to bring this down to 1 kg/kW in the next five years. The solar photovoltaic is about 7 kg/kW but is expected to be improved over the next few years. The radiator panels are the most difficult to scale up, at about 25 kg/kW. This is an area that needs work, though in all simulations for mission masses the assumption is 25 kW (radiated) for the radiator panels. 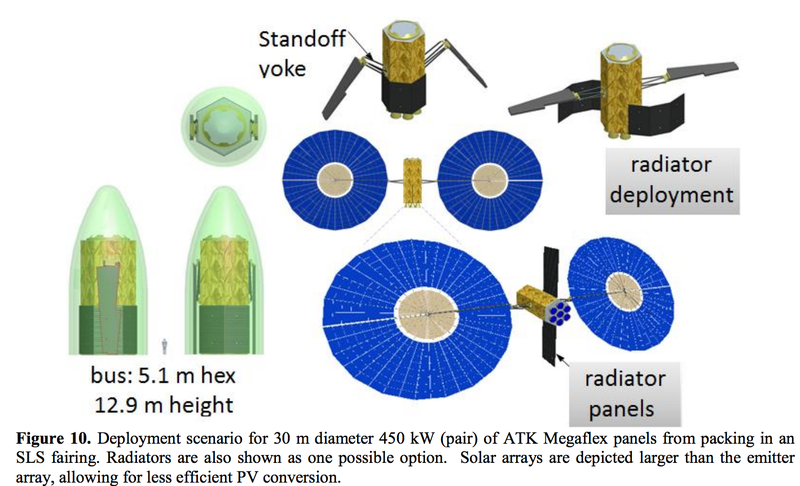 ATK has to scale their existing 10 meter diameter design to push the PV arrays to 30 meter diameter which will yield about 225 kW per manufactured unit, or 450 kW per pair and still fit in an SLS PF1B 8.4 m diameter fairing. 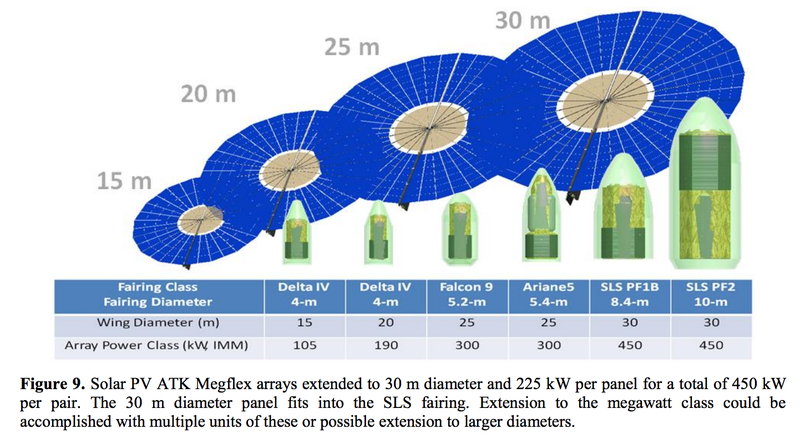 The scaling and deployment of the PV arrays to larger sizes for various launch vehicles is shown below. Even larger sizes into the megawatt range can be anticipated in the future. The SpaceX BFR could be flying in about 5 years. This will enable 150-ton payloads and could deliver over a megawatt of solar arrays every launch. If the solar arrays were assembled in space then the solar arrays could be made lighter since they would not need to be able to withstand the 3-G strain of launch. The US military will be building hundreds of megawatt and multi-megawatt combat lasers for Navy ships, army and air force systems by the mid-2020s. These systems will provide the technological base and production capacity for the 400 megawatt laser array.